This page will link to our branch of the Blake Family Tree. If you find any errors, or have some additional information, please contact me so it can be corrected and updated. 21 generations of The Blake Family. Starting circa 1277. "This family is of British extraction, and, though the name seems derived from the Saxon, Blac, a colour; yet, Debrett, in his Baronetage, says, "they are traditionally descended from Ap-lake, one of the knights of King Arthur's round table," and adds, "that in the reign of Henry II, one of this family accompanied Strongbow,and after many exploits built himself a castle, at Menlo, near Galway." Richard Caddell surnamed Blake,(from whom, according to Lynch's MS. the Blakes of Galway are descended,) was sheriff of Connaught, Vicecomes Conacioe, 32 and 33 Edw. I, he was also sheriff in 1306. and in 7 Edw. Il. the king's writ issued, for arrearages of his account. The arms of this family were first borne by him and descended to his posterity. 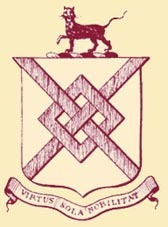 The family of Ardfry, descended from Sir Richard Blake, who was speaker or chairman, of the assembly of the confederate catholics of Ireland, at Kilkenny, in 1647, was raised to the dignity of the peerage, in the year 1800, in the person of Joseph Henry Blake, Esq. who was then created Lord Baron of Wallscourt, in the kingdom of Ireland. This widely extended name is, at present, divided into the opulent and respectable families, of Ardfry, Ballyglunin, Belmont, Castlegrove, Corbally, Forbough, Frenchfort, Hollypark, Killeencastle, Mace, Menlo, Merlinpark, Moorfield, Orancastle, Rahara or Annbally, Renville, (formerly of Lehinch, in Mayo,) Tully, Waterdale and Windfield, in the County of Galway; and Ballinafad, Brookhill, Garracloone, Milltown and Towerhill, in the County of Mayo." A series of web pages generated by Personal Ancestral File (from the The Church of Jesus Christ of Latter-day Saints, or Mormons. They have the largest collection of free family history, family tree and genealogy records in the world - a great place to do some research if you are interested in genealogy.